[GIVEAWAY] 2nd Blog Anniversary Celebration! This giveaway was suppose to be up in December, for the 2 year celebration of my blog. This is just a small gesture to say "THANK YOU" to all my lovely followers and readers, and to welcome all the new ones. Thank you for reading, for your lovely comments, for all the questions and for following - means A LOT to me. Giveaway open for PAKISTAN only. There will be 3 winners - Yay! 1st Winner will get Denesy Nail polish/nail art set, Creme eyelash curler and Luscious Cosmetics 2 single eye shadows. 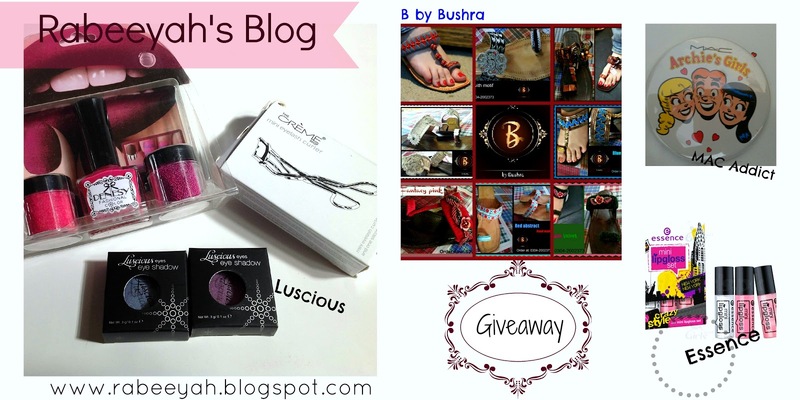 2nd Winner will get pair of Khussa or Kolapuri sponsored by B by Bushra. 3rd Winner will get Essence Lip Gloss set. And, one of the winners will get the MAC Archies Collection Badge sponsored by MAC Addicts. Entries that are mandatory, means you HAVE to do it. If one will be missing, you will be disqualified. Don't forget to leave your email ID - winner will be notified via email. The name of the winner will be up on Facebook, Blog and on Twiiter. Winner should contact within 72 hours after receiving the email. If the winner doesn't contact, another winner will be chosen. NO fake entries. You can only submit the form once with your original name that is on your ID card. Winner will be asked to show the picture of the ID card, before sending out the gift - so NO fake entries. Fake entries will be disqualified. Share the giveaway on your Facebook ONCE. You can Tweet as many times as you want. Also read Terms & Conditions at the bottom of the form. my fav summer product is lip gloss..
essence gel liner becs its waterproof and smudgeproof! :) im so proud of you rabeeyah. keep going strong! It has to be shades. My favourite product is kajal and a pink gloss for spring/summer.